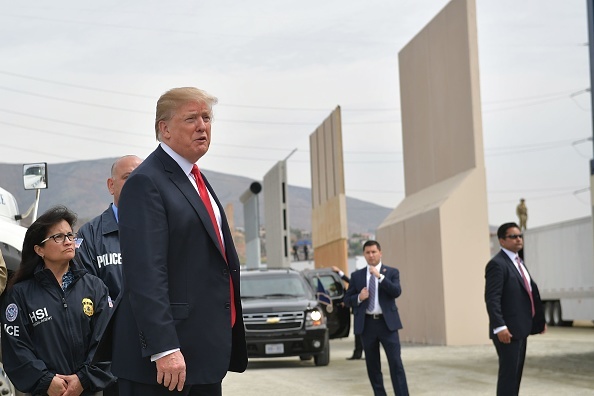 President Donald Trump has solidified his suggestion that the U.S. military will build the wall along the southern border, as the chances of Congress passing funding for the project by the Dec. 21 deadline shrinks. “Because of the tremendous dangers at the Border, including large scale criminal and drug inflow, the United States Military will build the Wall!” Trump wrote in a Dec. 19 tweet. The Pentagon has backed Trump, acknowledging there is a legal option to use military funds for border barriers, although also saying there’s no plan in place to do so. Trump has asked Congress for $5 billion for the wall, but has faced a unified opposition from the Democrats and even from some Republicans. Trump has repeatedly said he would partially shut down the government over money for the border wall, meaning he would veto a Homeland Security budget bill that doesn’t include the funding. A large part of the government is already funded through next September, including the military, public health care agencies, education, and veterans’ programs. Yet Congress still has roughly $450 billion of funding left to approve before several agencies run out of money Dec. 21. As the deadline draws near, Republicans appear to have lost hope that they’ll be able to convince at least nine Democratic senators to reach the necessary 60 votes to get the border-wall funding through. On Dec. 19, Congress began advancing legislation to the remaining federal agencies through Feb. 8, excluding the wall money. “We’ll soon take up a simple measure that will continue government funding into February so that we can continue this vital [border security] debate after the new Congress has convened [in January],” said Senate Majority Leader Mitch McConnell (R-Ky.). A Senate Democratic aide said the appropriations bill, which would keep the Department of Homeland Security and several other agencies operating on a temporary basis, was expected to pass the Senate on Dec. 19 or Dec. 20. The House of Representatives would then have to pass the bill and hope Trump signs it into law. By postponing decisions on spending for agencies that include the departments of Justice, Commerce, Interior, and Agriculture, Democrats will have more power over the process next year when they take majority control of the House, though that will also put a greater spotlight on their responsibility for the process. In an attempt to resolve the impasse this year, Trump and McConnell on Dec. 18 proposed giving Trump a $1 billion fund that he could use at his discretion for border security. Senate Democratic Leader Chuck Schumer (D-N.Y.) labeled that a “slush fund” that would lack the votes to pass Congress. The White House said Dec. 19 it would look at already appropriated government funds to be redirected toward building the wall if Congress continued to block its request for the money. Democrats have already signaled they will try to stop Trump from using other monies on the wall. Schumer, speaking on the Senate floor Dec. 19, said the administration couldn’t legally do that without Congress’ consent. “The House and Senate will not approve a wall from reprogrammed funds or anything else. It won’t happen,” he said. Trump’s senior adviser Kellyanne Conway took Republican lawmakers to task for not pushing harder on the issue. Trump originally promised that Mexico will pay for the wall. He’s recently brought back the argument, saying the new trade agreement with Mexico and Canada (USMCA), gives the United States more of a trade advantage with Mexico and thus enriches the United States more than the wall would cost. “Mexico is paying (indirectly) for the Wall through the new USMCA, the replacement for NAFTA! Far more money coming to the U.S.,” he said in one of the Dec. 29 tweets. The wall was projected to cost some $24 billion. Customs and Border Protection (CBP), the federal agency responsible for border security, has a priority plan for 33 segments of wall covering 1,100 miles in total. The cost varies from $5 million to $25 million per mile, depending on the terrain, CBP Commissioner Kevin McAleenan said during a Dec. 11 congressional hearing.